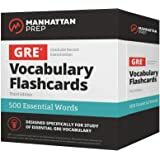 Manhattan Prep's GRE Vocabulary Flash Cards go above and beyond other GRE flash cards on the market. Designed help the student develop a lasting understanding of the word in a GRE-relevant context, the backs of all cards contain a word "network" with definitions, usage, synonyms, and more! 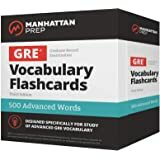 500 Advanced Words is the second in a 2-volume set of GRE flash cards—start with essential words and graduate to advanced vocabulary. Together, the sets comprise the most comprehensive vocabulary study tool on the market. Great Flash Cards. It sure is better than all vocabulary books that you are able to find in China. 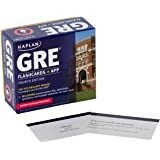 If you have students, or if you are a prep student waiting to crack GRE, tell them or yourself: buy it now or buy it later. I teach standardized tests full time and recommend these vocabulary flash cards to my students over all others. They're well put-together, both in terms of their physical qualities and durability, and the content therein. 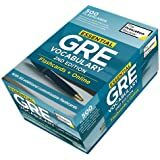 Coupled with the 500 Essential Words box set, it's one of the best investments to make for GRE studies. My only contention with the list is that, every so often, Manhattan seems to get a bit lazy with etymologies. I remember a few words that begin with "de-" where the prefix "de-" emphasizes a definition rather than giving its opposite. An example is the word "delimit", which means "to set boundaries." Rather than explaining that the "de-" is a root from Latinate languages, they just shrug it off and say "this prefix doesn't seem to do much", but it's a very common trait in English phrasings, as in the words "definite", "demarcate", "delineate", and so on, where the "de-" prefix is actually reinforcing an idea. I used this set (along with the 500 essential words pack from Manhattan prep), and I felt like this set was most helpful. The cards are slightly larger than a normal index card size, and relatively sturdy. The words given in this pack were almost all new to me, as a senior in college with a high GPA, and I can honestly say that many of the words I memorized from this card pack did show up on the actual exam. I used this card pack pretty extensively for about two weeks before I took the exam, in addition to taking free practice exams, and scored above average. Out of all the study tools I used I do honesty feel like this set was the most helpful. 5.0 颗星，最多 5 颗星Super helpful set of flashcards! These were very helpful to study prior to the GRE. I studied this set of flashcards for a good 2 weeks before my exam and scored in the 98th percentile. Not all of the words on my exam came from this set, but a good handful did. It's also handy that they come hole-punched, with a ring to keep them together. I could throw the ring in my bag and not have to bother with lugging the whole box around, or trying to keep the cards together with a rubber band. 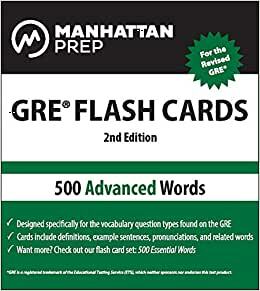 I also purchased the 500 Essential Words: GRE Vocabulary Flash Cards (Manhattan Prep GRE Strategy Guides). I would say, if you're an English major, or someone who reads a lot of English Lit, it wouldn't hurt to get both, but focus more on this set, as they'll definitely be more of a challenge. You'll probably know most of the Essential words already. Amazing. I went through the essential flash cards first, which weren't as challenging but did fill in some gaps in my vocabulary. If you want the easiest strategy to boost your verbal (and writing) scores, these cards are it. I memorized 10-15 cards a day, and reviewed all of them every week. It just takes a lot of diligence to memorize all of them and revisit them until the day of the test. Like I said, it's the easiest way to boost your verbal score since all you have to do is memorize, and you have complete control of how many vocab words you want to learn/memorize before the test. Not only that, including the vocab in this deck in your analytical writing essays will also help you increase your writing score. The cards also have similar words/synonyms that you can push yourself to memorize and group together as well. I'd like to say they were made with quality...the paper was thick and a little glossy, the text was easy to read. The little key ring that you can put in the perforation in the cards is extremely helpful...if I was on the go I'd take the cards everywhere with me...at a coffee shop, at the gym, etc. The key ring makes the cards mobile and accessible and keeps them from becoming a mess. I'd highly recommend if you're looking to increase both your verbal and writing scores. 3.0 颗星，最多 5 颗星Product is good, but be careful some cards maybe doubled and some are missing.